I got stuck on this final post about our trip to Norway last summer. So stuck that seven months have passed since "Part 9" of this series. But I'm here today to attempt the conclusion in "Part 10". I'm just not sure how to close the door on this adventure. I still have dreams about this place. So I leave you with the photos of our last day in the fjords. We explored the town of Solvorn and walked on a ferry to cross the Lustrafjorden. On the other side was the village of Ornes and the 12th century Urnes Stave Church. 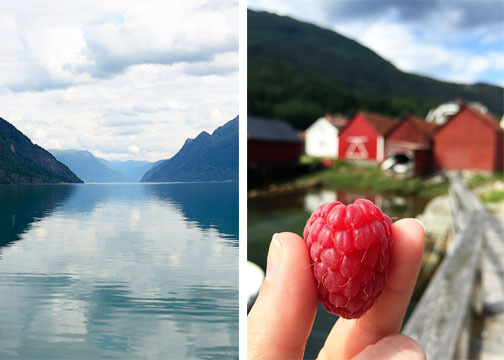 Both sides of the fjord had fields of giant raspberries. The many hours of daylight in the summer here result in some amazing fruit. I hope to go back to Norway. I want to see it again in the summer and also in the winter. I want to explore more of the fjords and visit our favorite places again from this trip. I want to remember the feeling of waking up in the middle of the night on a cliff overlooking the fjord and seeing lights from a little village in the distance and a light pink glow on the water and the sky and the fjord walls. All content belongs to copper+cedar. Do not use without permission. Simple theme. Powered by Blogger.